Gov. Bruce Rauner is asking the Illinois Legislature to allow work to start on Interstate 55 in the Chicago area via a public-private partnership. Rauner, the state transportation secretary and Republican House Leader Jim Durkin made the push at a news conference on Monday. "It's just time to move on with this thing and get it done," said Illinois Transportation Secretary Randall Blankenhorn. They say the Illinois Legislature needs to pass a resolution supporting the project by the end of the month. Rauner wants the state to be able to partner with private investors to add a toll express lane in both directions of Interstate 55 between Interstate 355 and Interstate 90/94 in Chicago's southern suburbs. 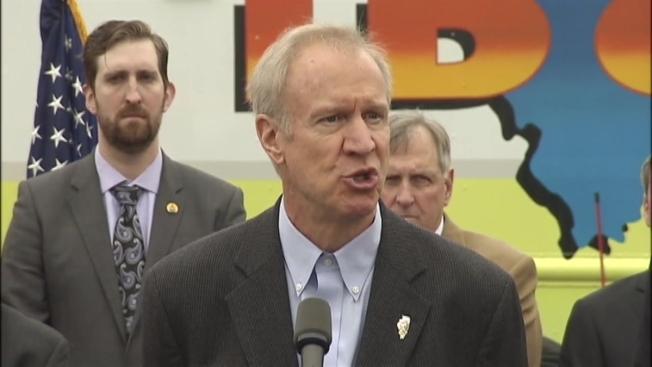 "We need to grow more jobs by increasing the capacity of our transportation system," Rauner said. "And while we are doing that we are creating high paying, good, quality construction jobs to expand this system--this is a win at every level." Democratic House Speaker Michael Madigan says he's still waiting for more information on the project from the state transportation department. Madigan says that includes a plan explaining costs and anticipated tolls. But for some drivers who regularly use the Stevenson, reaction is mixed. Commuter Alex Martinez called the proposal "ridiculous." "You already pay enough taxes and all that stuff," he said. While Khafani Milsap would be happy to pay the toll. "That's a good idea--a lot faster, it will work," Milsap said.